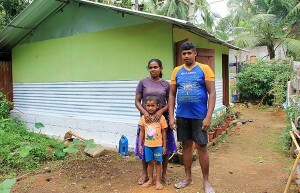 Ravindra Mithrajith, Kusumawathie and their son outside their new home. In May 2016, extreme weather conditions caused by cyclone Roanu resulted in severe floods and landslides in Sri Lanka. The disaster affected approximately 500,000 people in 25 Districts, resulting in 93 deaths, while 6,382 houses were fully damaged and 25,958 houses were partially damaged. The Districts of Colombo, Gampaha and Ratnapura were the most affected by the floods, while Kegalle district was affected by several landslides. In response to this crisis, UN-Habitat is providing relief assistance to affected communities in Colombo and Gampaha districts in the Western Province through the project “Emergency Shelter Relief for Flood Affected Families in Colombo and Gampaha Districts in Western Province, Sri Lanka”. The project is funded by the United Nations Central Emergency Response Fund (CERF) with additional funding from UNHCR and the Government of Switzerland. This project is addressing several CERF life-saving criteria for affected people including provision of transitional shelters, essential Non Food Items (NFIs), repair of wells and toilets and cleaning of canals. 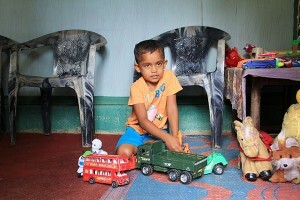 In Colombo district, 56 families are being provided transitional shelters through this project. 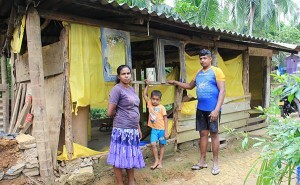 Mr. Mithrajith’s family from Wekawatha in Kaduwela was recently provided a transitional shelter to replace their home which had been badly damaged by the floods. The family next to their old home damaged by the flood. Wekawatha is a Grama Niladhari division in Kaduwela DS division in Colombo district with a population of 1,800 people. The village is located in close proximity to the Kealni river. The flooding as a result of cyclone Roanu had affected over 350 families, nearly 1,050 people, in this village. Many of the flood affected families had taken shelter in temporary relief camps in schools, temples and with host families until the flood waters subsided. Ravindra Mithrajith, had lived in this village for the past 30 years. Kusumawathie, hailing from a village in Nuwara Eliya district had married Ravindra in 2006. They have a 7 year old daughter and 5 year old son. Ravindra’s occupation is manufacturing cement blocks in a nearby yard, while Kusumawathie looks after the home. Ravindra, who had been gifted a plot of land by his parents had built a home for the family where they had lived for the past 9 years. Unfortunately, the intensity of the flood due to the overflow of the Kelani river had destroyed their house, built mainly with wooden planks, making it uninhabitable. Ravindra recalls that their house had been flooded with about eight feet of water and their belongings including their clothes were destroyed. During this time, they moved to a neighbouring family member’s house situated on higher ground until the waters subsided. The living room in the new home doubles up as a play area. When UN-Habitat commenced project activities in the area, Ravindra and Kusumawathie were selected for assistance as they had no financial resources to rebuild their flood damaged home. The construction of the shelter commenced in October 2016 and took just 10 days to complete. Their new home has been constructed with a mix of cement blocks, tin sheets and plywood boards for walls and Zinc Aluminium sheets for the roof. The floor has been rendered with cement. The shelter is 200 square feet and consists of a living room, bedroom and small kitchen. As Ravindra has basic construction skills, he was actively engaged in the construction of the transitional shelter and the family moved to their new home on 15 October 2016. Kusumawathie in her home garden. The CERF project is being implemented by UN-Habitat in the districts of Colombo and Gampaha from June 2016 – February 2017. The project aims to assist 130 families with shelters. Overall, 85,500 people will benefit from this project through numerous interventions including repair of wells and toilets, NFIs and canal cleaning. UN-Habitat is implementing this project in close collaboration with the Government of Sri Lanka and several partners – the Rural Development Foundation (RDF), Sri Lanka Red Cross Society and Sri Lanka Land Reclamation & Development Corporation (SLLR&DC).